The Stacked Red Oak Vent Free Log Set by Duluth Forge features a traditional and classic style focusing on the look of Oak logs with charring to provide a realistic full log look. During the burn season and in the off season, the log set is an attractive accent to your room. It’s been carefully hand crafted to give you the look and feel of a real wood-burning fire. 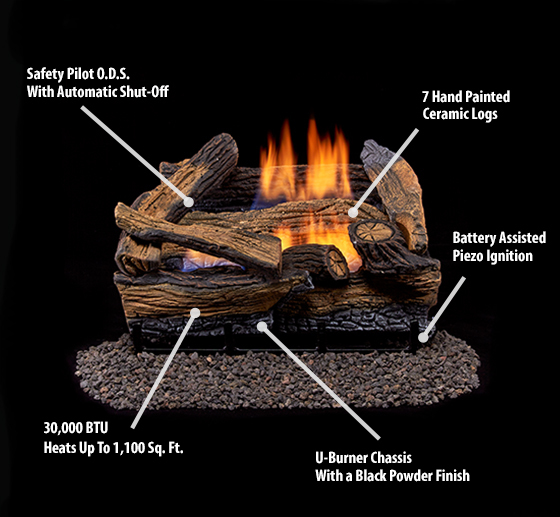 The Stacked Red Oak Log Set features 30,000 BTU and a simple manual on/off control. It’s the perfect log set for creating that great classical ambiance for your home. The quality and efficiency of Vent Free Heating provides savings on your heating bill in addition to enhancing your home and hearth.